The schematic diagrams given on the following pages have been carefully chosen to illustrate the use of different generic tube types in diversified transmitting applications. All of the circuits are designed to give reliable and satisfactory performance; they show, for the most part, simple, conventional, straight-forward arrangements which experience has shown to be dependable. Although relatively few circuits are given, it is often practical to use a portion of one circuit in combination with portions of other circuits to obtain a design meeting the desired requirements. 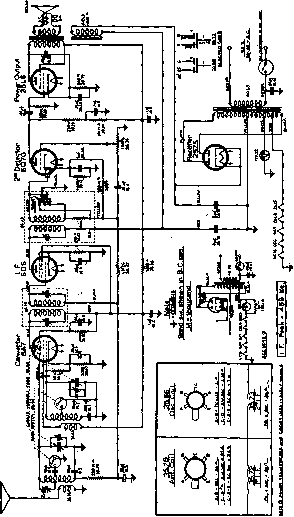 In general, almost any circuit shown using a triode, tetrode, or pentode tube type is equally suitable for any other tube type in the same generic group, provided the necessary revisions are made to meet the ratings of the tube used. The capacitance values given for the various tuned circuits are in terms of p/ii per meter of wavelength, and are the actual capacitances in use—not the maximum capacitance of the condensers. The value of inductance in each case is determined principally by the total shunt capacitance and by the operating frequency. The indicated capacitance values, in most cases, are chosen for an operating Q of 12, which is suitable for amateur transmitters intended for either telephony or telegraphy. Some other applications may require a somewhat higher Q for telephony. Information on the characteristics and the application features of each tube, given under each tube type, will prove of assistance in the understanding and the utilization of these circuits. Frequent reference to the chapters on INSTALLATION, APPLICATION, and TRANSMITTER DESIGN CONSIDERATIONS will also prove helpful.